A few weeks ago, some of my girlfriends from the Rhody Bloggers and I got to check out Citron Spa. Located on Angell Street in Providence, it is Wayland Square's newest oasis. A Wellness Sanctuary like no other, we offer a modern boutique feel with a nature inspired decor. Inspiring yet relaxing, our philosophy of rustic nature meets modern science offers a soothing, result oriented experience for our guests. Our services range from the latest technology in laser hair removal to massage, facials, waxing, and nail treatments that incorporate the use of all natural ingredients. I can't tell you how excited we all were to walk in and be directed to the lounge area. I already loved the sound of that. It wasn't a typical noisy spot where you wait for whatever service you will be getting. A separate room with relaxing chairs on one side, comfy seats in the window on the other where the sunlight was streaming in. I chose the comfy window seat with Carla. Offered our choice of beverage, I leaned toward the mimosa (because how can you say no to a mimosa) but ended up going with the soothing tea. It was freezing out that morning! We were all chatting and feeling relaxed, when some girls came in and put soft, heated neck pillows on us. Amazing. As busy moms who never really take the time to do anything for ourselves, I think we could have stayed in the lounge all day. Without treatments even! 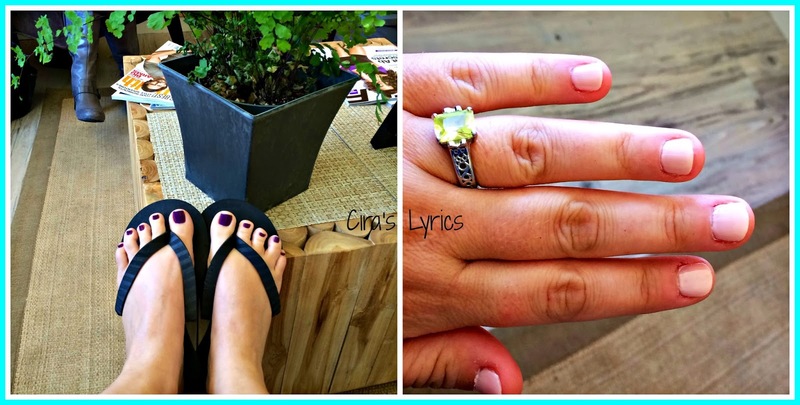 Shortly after that, it was time for our pedicures and manicures. Heather, Carla and I went to the Foot Bar first. Heather was getting the Stress Fix, Carla a seasonal one with actual apples and cinnamon and oatmeal she could eat if she wanted to (she didn't), and I was there for the Caribbean Therapy. What did I tell you. See the apples in the water with Carla? I was loving the all natural products they used. Let me tell you about my Caribbean Therapy pedicure. Exfoliating with salt and Caribbean cane sugar; softening and conditioning skin with coconut, avocado and passion fruit oils; uplifting with island aromas, including a warm detoxifying seaweed masque on the legs and feet. Complete with a foot and leg massage, hot moist towels, and mango and cocoa butter body creme infused with lime, bay, vetiver and amyris oils. That's the warm detoxifying seaweed mask right there, which was wrapped in towels after that. Might not look so pretty but trust me when I say it felt so good. And the massage part was my favorite. I chose a sparkly purple polish for my toes and then we were over to the Nail Bar. The Caribbean Therapy Manicure starts with a moisturizing milky Caribbean hand bath, precise nail grooming and renewing exfoliation followed by warm detoxifying seaweed masque and warm moist towels while you receive a neck and shoulder massage. A hand and arm massage then softens and smoothes the skin with a mango and cocoa butter body creme infused with lime, bay, vetiver and amyris oils. Now I don't have nails. Unless I am getting them put on, there isn't much there. They are always breaking just as they start to look nice. I was a little worried about how I was going to get a manicure without nails, but it was not a problem at all. I went with a very pale pink and I am telling you weeks later that I think getting a professional manicure helped my nails a little. Not only do they look better than they have in I don't know how long, but they are even growing a little longer. The neck and shoulder massage during the manicure alone will keep me coming back to Citron. Amazing. And so relaxing. I could have fallen asleep. You must try the Caribbean Therapy. My nails after the mani/pedi, back in the lounge as I finished letting them dry. Citron spa isn't just for nails. They offer a variety of other services - facials, waxing and threading, makeup, body masques and wraps, laser treatments and massages. I am in love, and will definitely be back. Now for my favorite part. Citron is letting me give away a manicure and pedicure! 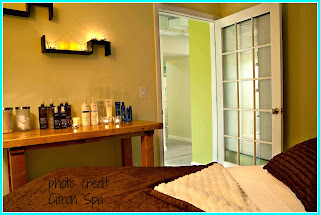 This giveaway is open to Facebook fans of Citron Spa. 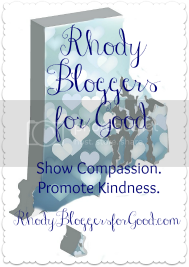 To enter, leave a comment on this post letting me know what you do to relax and pamper yourself. For an additional entry, tweet this giveaway. Come back and leave the link in an additional comment so I can verify it. Winner will be selected by Random.org on Friday, November 15th at noon and notified by email. In addition to their website, you can also follow up with Citron Spa on Facebook and Twitter. I spend time with friends to relax! I relax by going to pilates a few times a week and a massage once a month, but am in desperate need of a relaxation day with a mani and pedi... it's been way too long!! I want to go back there and relax and get my nails done again! While I definitly do not relax enough, I do get a massage once a month and have just started going to yoga once a week. A mani/pedi is definitely a splurge for me!!! I have never had a pedi before. Mani's, yes. I've been getting back into Zumba to relieve some stress. Between being a care giver to my Mom and being a mother to young children and working a full time job. I would love to sit and relax and be pampered for a bit! A mini vacation! Sounds like you had a wonderful time and the place looks like they go the extra mile for their clients. Listening to some of the classics on vinyl with a nice mug of coffee/glass of vino in hand does wonders... but a mani/pedi would be awfully nice to complement that! This place looks amazing!! I need a good massage and pedi! I will definitely be looking into this place! Thanks! I use to go to monthly prenatal massages, but now that I have a hyperactive 9 month old I have not had a chance to relax. 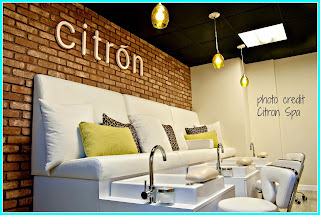 A good mani/pedi at Citron would be fantastic! Love the photos and details. To relax I am a radio up, drive around on a sunny day girl, but other things that work is a day of reading or a pedicure with a book! That place looks awesome! We totally have to go... well, you need to go back and I need to try it out! Reporting my 1st too: I like to read and have a glass of wine. Take a nice, hot bath! A glass of wine helps me to relax! Wow, that place looks amazing!! I need more massages..that's relaxing! I wish I could say I get to relax. Usually I have about 30 minutes between the time the kids go down for bed and when I go to bed. :( I work super early in the morning! I spend that time reading or catching up on a show I missed. I would love to win this!